This book provides an overview of the operation of container terminals and the associated risks with such operations. These risks are often ignored or not properly investigated by both scholars and practitioners. 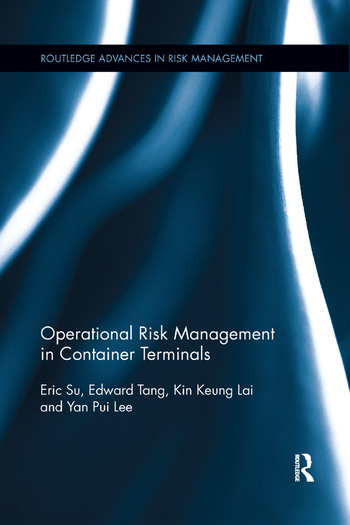 Operational Risk Management in Container Terminals explores and discusses the decision rationales and the consequences for these operational risks handling process, with in-depth investigation on the container terminals in the Asia-Pacific region. The topics covered include the history and development of the container terminals, the operation of the terminals and risk incurred, the risk-management theories and concepts, rationales and consequences of the risk decisions in the container terminal operations, common practices and recommendations on terminal operational risk handling. Eric Su is currently the General Manager – Engineering of Hongkong International Terminals. He holds an EMBA degree and an DBA degree with City University of Hong Kong and is a Fellow of the Hong Kong Institution of Engineers. Edward Tang is currently the General Manager – Operations of Hongkong International Terminals. Having started his career as a pier supervisor, Mr Tang has more than 35 years' experience in the container terminal industry. Kin Keung Lai received his PhD at Michigan State University, USA. He is currently the Chair Professor of Management Science at the City University of Hong Kong. He is the founding chairman of the Operational Research Society of Hong Kong and currently the president of the Asia Association on Risk and Crises Management. Yan Pui Lee received her Master of Art in Transport Policy and Planning from the University of Hong Kong. She is now pursuing a PhD degree at the Department of Management Sciences of the City University of Hong Kong. Her research interests include transport and logistics management.